Here at Thelma Jones students are learning a skill that will take them far in life... Kindness! "Students behave better, discipline rates have decreased, they are more inclusive of others, student conflicts have decreased and the relationships between students and teachers is much stronger." We don't just expect our students to know how to show kindness to others, we model it and teach it in many of our unity lessons. They are taught to be caring, show compassion, speak using kind words, to share, etc. 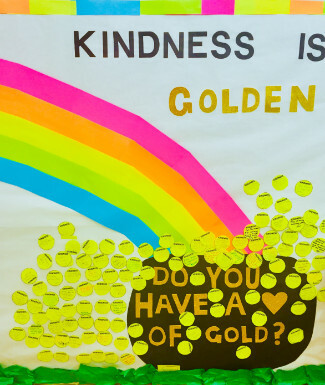 We currently have a project going called "Kindness is Golden" where students who do a kind deed are celebrated on the kindness wall in the main hall. The adult who observes the student's kind act writes it on a kindness coin to add to the pot of gold pictured here. Let's see how much our treasure grows by the end of the year!